As the air gets cooler, breakfasts become warmer. And although I do love a morning smoothie, I equally love a hearty, hot breakfast. And today I am making one of my favorites: Blueberry Almond Porridge. Porridge, another name for hot oatmeal or cereal, is a great fall breakfast. It is incredibly versatile, so you can add anything you like and customize it to your taste. I love adding fruit, spices and a little sweetener like honey or brown sugar. Delicious, creamy, and warm, this recipe will comfort you any chilly morning. For this recipe I use frozen blueberries. Now that berry season is over (and the price of berries has skyrocketed! ), I love using frozen berries for oatmeal and smoothies instead. I heard once that frozen blueberries may be better for you because they are frozen when their nutritional content is peaking. Berries are packed with vitamins and antioxidants. Using frozen berries is a great way to savor the taste year round and nothing beats their refreshing tartness. To create the almond taste, I use almond milk and almond butter (which is optional, but it adds a rich nuttiness to the dish). The oats are sweetened with a touch of brown sugar, but any sweetener would do (maple syrup would be good too...mmm), or you could omit. I also add a touch of cinnamon, just to warm the flavors and create a bit of earthiness to the oats. To make it extra hearty and extra filling, I add flax seed, which creates texture and more fiber. 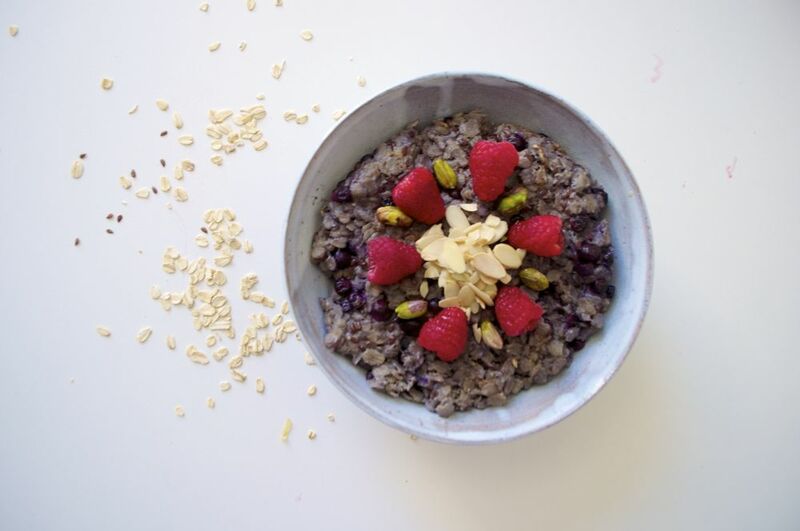 For a powerful but healthy morning breakfast, I highly recommend making this Blueberry Almond Porridge (I’ve been literally eating it all week and I’m obsessed!). It only takes 10 minutes and you'll feel fueled and ready for the day! Share your morning breakfasts in the comments below and on Instagram and Twitter using the hashtag #friedparsley. Happy eating! Follow the instructions of your oats package. In a pot, bring the almond milk and pinch of salt to a boil. Add the rolled oats, flaxseed, cinnamon, and brown sugar. Reduce heat to low and cook, stirring occasionally, for about 8-10 minutes (time will depend on the consistency you like and the cooking instructions). Add the blueberries and almond butter and cook until heated through. Pour in a bowl and top with whatever you like. I like sliced toasted almonds, raspberries, bananas, and pistachios. Enjoy!